FC Impuls Dilijan - FC Banants Yerevan 1:0. 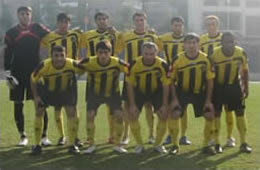 17 April 2011, Armenian Premier League, Week 05. Goal: Artur R. Petrosyan, 22 (1:0). HQ Extended highlights, by Armenian-Soccer.com. 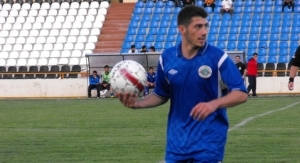 FC Impuls Dilijan all goals scored in 2010, including Armenian Premier League 2010 and National Cup goals. Compilation made by Armenian Soccer. Credits: FC Impuls, Hayk Ugujyan and Tigran Israelyan (FFA). Իսկ ինքդ քեզ տեսնո՞ւմ ես ազգային հավաքականում.. Agencies, Newspapers and Internet sites can freely reproduce the content, quoting the source: armenian‐soccer.com. Any content reproduced will not be used for marketing purposes or sold/transferred to third parties for marketing purposes. ArmenianSoccer: The phase of Youth Teams is in the past for you and Vardan Minasyan is now going to announce the National Team lineup. What expectations do you have from your National Team career? Zaven Badoyan: I cannot predict if Vardan Minasyan is going to invite me to play for the National Team or not. Everything depends on my performance during regular season. AS: You were called up to take part in the last training with the players from Armenian clubs only. What impressions have you got? ZB: Yes, I was there. My impressions are only nice and positive. Especially that I know most of the players from youth teams. Do you think that your generation of young players has something to say and do on the National Team? ZB: There are many talented young players. However, young footballers must prove in each game that they have the quality to play for their clubs and, moreover, the National Team. AS: Do you see yourself in the National Team? ZB: I do my best to play well in the championship. I hope that coaches will notice me and invite. AS: Please outline your career phases. ZB: In the Premier League I have started in 2006 for FC Kilikia. In 2007 I was drafted by military. 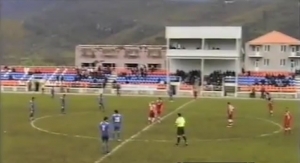 I served in Kapan and, therefore, played for FC Gandzasar. Upon demobilization I received an invitation from FC Impuls. AS: Over your career you have mostly played for province clubs. 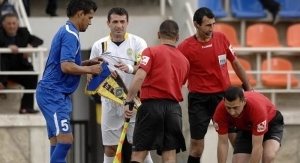 Is the difference between province and Yerevan football huge? ZB: I am now playing in Dilijan and it is very important for myself and all our players to play there. Dilijan fans really support us. AS: Are supporters in Yerevan and provinces different? ZB: I do not think there is a difference. Eventually every supporter wants to actively support his team. AS: While playing in Kapan was it difficult for you to combine football with military service? ZB: Perhaps it was difficult, but thanks to good people, my friends, family and officers, I was able to combine the two things. AS: Is there a difference between Yerevan and province football in terms of infrastructure, attitude, fields and training facilities? Z B: The difference is not so big. I would say there is no difference at all. The fields are well maintained. AS: Do you adapt for new towns and people easily? ZB: Yes… The experience shows that it is easy. AS: How a footballer in a province arranges his life? ZB: It is not essential if it is a province or not. It is the matter of taking good rest in between the games and trainings to be ready for playing well. AS: How do you prefer to rest? ZB: I prefer taking rest at home. AS: What music, movies, and other sports do you prefer? ZB: Well, I like movies and music; it is part of my everyday life. I like Modern Talking very much. AS: You had many coaches. Who has contributed the most to your paying capabilities? AS: Who do you feel bound for the opportunity to play football, from people you know, the game stars or your coaches? ZB: I would not play football if not my father who took me to play football when I was 6 years old. AS: Do you consider yourself a lucky player? ZB: Sure. One of my successes was that I played during my military service. Not everyone can combine. In general, being lucky is essential in football. AS: What are your objectives in football and what are the goals you play the game for? ZB: Each footballer dreams of playing for a high-class club. To achieve this goal, just like every goal, you have to work hard and believe that you can do it. AS: Which championship or a club you dream to be part of? ZB: I like Spanish La Liga very much. My dream team is Barcelona. AS: Thank you for the interview. We wish you success in your career.